At Proton we feel the most important factor in using kitchen chemicals is staff safety. All our products are colour coded to degree of hazard. Our stainless steel wallshelf gives the products ‘a home’ for neat storage and easy dispensing. 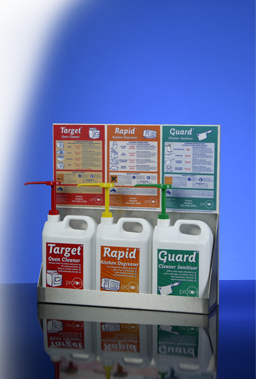 The laminated charts give clear usage instructions and feature full COSHH information on the rear. Our unique magnetic mounting system allows for fast removal to accompany anyone requiring medical attention.